A computer virus, much like a flu virus, is designed to spread from host to host and has the ability to replicate itself. Similarly, in the same way that viruses cannot reproduce without a host cell, computer viruses cannot reproduce and spread without programming such as a file or document. In more technical terms, a computer virus is a type of malicious code or program written to alter the way a computer operates and that is designed to spread from one computer to another. A virus operates by inserting or attaching itself to a legitimate program or document that supports macros in order to execute its code. In the process a virus has the potential to cause unexpected or damaging effects, such as harming the system software by corrupting or destroying data. Once a virus has successfully attached to a program, file, or document, the virus will lie dormant until circumstances cause the computer or device to execute its code. In order for a virus to infect your computer, you have to run the infected program, which in turn causes the virus code to be executed. This means that a virus can remain dormant on your computer, without showing major sings or symptoms. However, once the virus infects your computer, the virus can infect other computers on the same network. Stealing passwords or data, logging keystrokes, corrupting files, spamming your email contacts, and even taking over your machine are just some of the devastating and irritating things a virus can do. While some viruses can be playful in intent and effect, others can have profound and damaging effects, such as erasing data or causing permanent damage to your hard disk, and worst yet, some are even design with financial gains in mind. In today’s constantly connected world you can contract a computer virus in many ways, some more obvious than others. 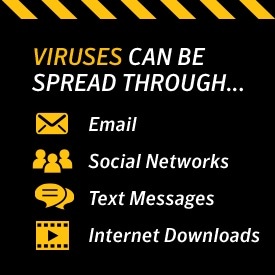 Viruses can be spread through email and text message attachments, Internet file downloads, social media scam links, and even your mobile devices and smartphones can become infected with mobile viruses through shady App downloads. Viruses can hide disguised as attachments of socially shareable content such as funny images, greeting cards, or audio and video files. To avoid contact with a virus it’s important to exercise caution when surfing the web, downloading files, and opening links or attachments. As a best practice, never download text or email attachments that you’re not expecting, or files from websites you don’t trust. How to protect against computer viruses? As you can see, just like a vicious flu virus, a computer virus is something that you want to avoid. The terms virus and malware are often used interchangeably; however, a virus is one of many types of malware, and only one aspect of the overall threat landscape. As a result, traditional antivirus software alone will not fully protect you from all threats. Instead, look into comprehensive security software like Norton Security. With patented technologies that work together to outsmart online threats, scanning your system for viruses, and running continuous automatic silent updates, Norton Security keeps you protected from existing, new, and even yet-to-be-invented threats. And if a virus slips through on our watch during your subscription period, Norton support experts will do everything they can to help fix problem at no additional cost. That’s the assurance and peace of mind you only get with our Norton Virus Protection Promise. No other free or paid security software service offers this kind of guarantee.